When should my child start their SAT ACT prep? The content tested on the SAT and ACT is content that your kids will be learning in school at different points in time. When you begin preparation will depend a lot on what math classes your kids are taking. The math sections on the SAT and ACT cover Algebra I, Geometry, Algebra II, and a little bit of Trigonometry and higher-level math. When your kids are taking these classes, it’s not a bad idea to incorporate some sort of test prep while the topics are still fresh in their mind. That way they won’t have to completely re-learn the material by the time the test comes around. Take a look at this SAT/ACT planning check list. When is the right time for my child to take the SAT or ACT? Test scores never expire. So if your child is familiar with all the topics covered, they can take it as early as 9th grade, and those scores will count for their college applications. The vast majority of students don’t take it until 11th grade. The latest that you want to take it is May/June before 12th grade. You want to fit at least 2 test attempts to qualify for SuperScoring as well as getting your application submitted for early decision. Both of these strategies increase your chance at getting accepted. Nowadays, the SAT and ACT resemble each other more. TestRocker has a short questionnaire to find out which test will be best for your child. There are two main differences between the SAT and the ACT. The ACT has a science section. The science section doesn’t require any prior knowledge going into it. It’s more of a mixture of the reading section and the math section. It measures your ability to interpret graphs, charts, and data. The SAT is more reading intensive, and there are more words you have to get through. If your child is a slow reader, that might be an indication that they’ll do better on the ACT. The vast majority of students do just as well as one as on the other. Try not to spend too much time figuring out which test your child should take, and instead devote that time to preparing and planning. How many times can my child take the SAT or ACT? There’s no limit—you can take it as many times as you want. That said, we recommend you take the SAT 2-3 times and the ACT twice. On the SAT, there’s a practice called superscoring, which means you can take your highest section scores from multiple test sittings and add those together to get your final score. So taking the SAT a third time only works in your favor if you can fit it in. Most colleges don’t superscore the ACT. Can I send multiple scores to colleges? Yes. On test day, you can list schools to which you want to send scores. Before test day, it’s a good idea to know school codes so you can list those. 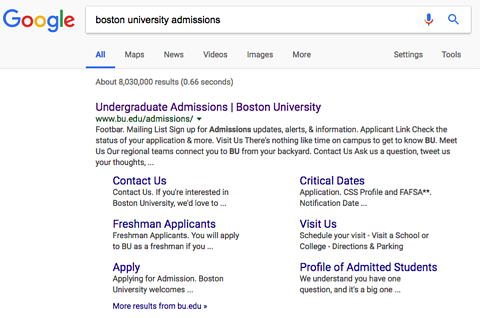 Sending multiple scores to the same school is a good way to demonstrate your interest in those schools. Also, most schools SuperScore. Learn how SuperScoring works. How many months should it take my 10th grader to study for the SAT or ACT? We recommend getting 30 hours of study time over your entire process. That’s when we see the best results. You can break that up however it fits best in your schedule. This allows you to use the summer and some of your less busy months for studying. The actual number of months isn’t as important. Of course, the earlier you can start, the better. 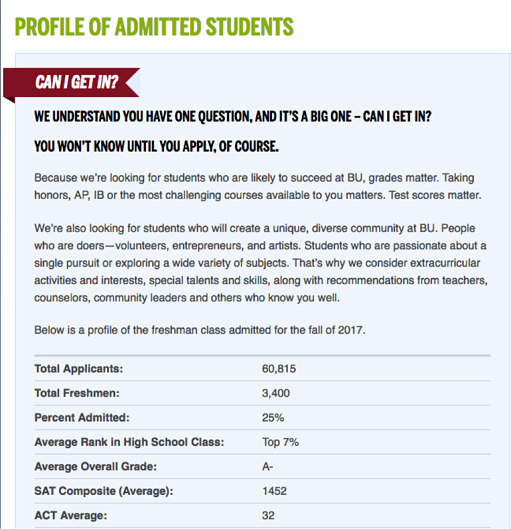 Do SAT or ACT scores help with financial aid? If a student gets a high SAT or ACT score, can they get more money to pay for college? Yes and yes. There are different thresholds that different schools apply. There are also other scholarship opportunities independent of the colleges, and qualifications include certain test scores. CollegeInsightPros works with students and their families to figure out the best course of action for saving the most money in college. I know students who have taken more than 10 practice tests and have not seen score improvements. Why is that? Shouldn’t their scores be going up each time? While it’s great to get a feel for the test, and you must do this before taking the test for real, continuing to do the same things over and over again without fixing what you’re getting wrong will only get you so far. This is why it’s a good idea to take practice tests once you have a solid understanding of the material. Figuring out where your strengths and weaknesses are and tackling those weaknesses will get you a better score. That’s why at TestRocker, we provide instruction for every single question you answer as part of our program. Talk with one of our SAT/ACT prep experts. The time is finally here, the long awaited and much deserved summer vacation. After a long and grueling semester filled with tests, final projects, and tight deadlines, it is finally time for students and their parents to take a break! Families are heading off on vacations or looking forward to staycations. Both of which include days dedicated to rest, relaxation, new hobbies, and family bonding. 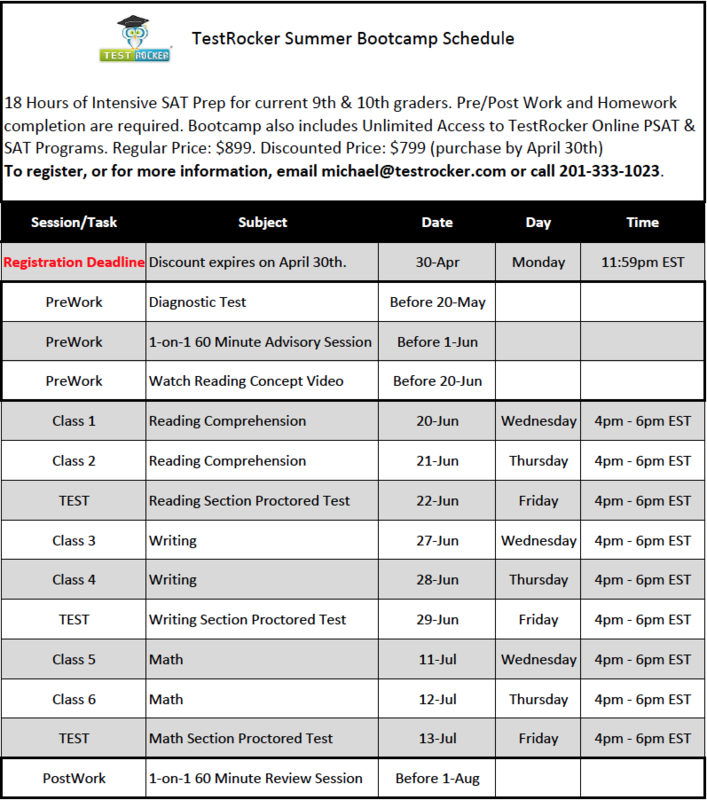 While we here at TestRocker believe the summer is a perfect time to decompress, we also see it as the perfect opportunity for high-schoolers to do some stress-free SAT/ACT prep. According to a study by John Hopkins University, children lose approximately 2.6 months of grade level equivalency in math during their summer months. This is because students often find themselves with no set routine and don’t receive the same level of intellectual stimulation that takes place in the classroom. Studying for these tests over the summer with a customized program like TestRocker will keep children engaged. The program also helps refresh many concepts that were learned in school. There is no shortage to the number of studies that show that retention is higher when students learn while relaxed. Students have more free time in the summer, along with the opportunity to take a brief break before getting back to studying. This is the chance for your children to study more effectively for the tests at their own relaxed pace, in a comfortable environment. Mistakes are made when we do things in a hurry. The same is true with studying for the ACT or SAT. One big mistake is starting to study without a plan and final goal in mind. Beginning SAT prep during the summer allows students to invest in a summer study plan. The absence of schoolwork also makes it much easier to make time for dedicated prep, 4-hour practice tests and quizzes. The next school year will bring along its own set of stresses: new classes, more activities, more tests, college applications, essays, deadlines and the tests. Use the summer to help your child get ahead of the crunch, and the competition. In 2017 Collegeboard decided to hold their first test date in August instead of September. This year it will be on August 25th. For most students this is before they go back to school, and it's useful to take the SAT before school starts as #3 explains, because 12th grade gets stressful. For more information on the August SAT see our post all about it. Additionally, this year ACT added a new July 14th test. Like the SAT, this now gives students the ability to take the ACT before going back to school. However, the ACT test is placed more in the middle of the Summer. That means less time to prep during the Summer so get to your prep now! End the summer well ahead of the curve when it comes to SAT & ACT prep, and begin the next school year without the additional burden of anything more than the occasional refresher. Take advantage of our special offer for students taking the PSAT and/or ACT. Get $100 off any PSAT combo program + access to our Summer Bootcamp. Graduation season is upon us—how exciting! All of that hard work and studying has finally paid off, and high school graduates are now about to embark on an exciting new chapter in their lives. A milestone such as high school graduation deserves special recognition. Show the grads in your life that you care with a gift that they’ll find useful and will enjoy. Stuck on ideas? The list below can help. This is probably the most common and most obvious. What college student couldn’t use a little extra cash to put towards their tuition fund or to enjoy the occasional night out with friends? 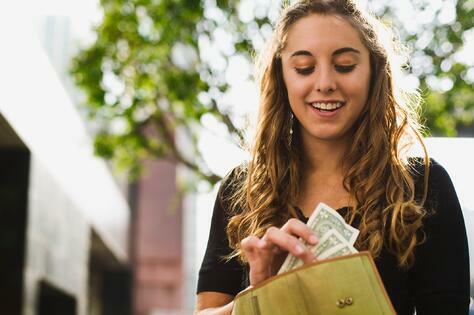 If you’re not sure what to get for a grad, you certainly can’t go wrong with money. On a similar note, you can get the grads in your life gift cards to places they might be frequenting over the next few months or years. Such venues might include Amazon, Target, Bed Bath & Beyond, Barnes & Noble, Best Buy, Walmart, and Starbucks. You can find these kinds of gift cards at your local grocery store, Walmart, convenience store or on their websites. Most undergrads (at least in their first year) won’t have cars with them on campus, and depending on where they’re going to school might need a way to get around. Many colleges have their own free shuttle services to get around campuses or places very nearby, but in the case that a student wants to venture out a little further, a public transportation card could be helpful. Depending on how far they are from their hometown, a plane ticket to get home for the holidays could also come in handy. Many major transportation companies give you the ability to send vouchers and prepaid tickets to another person, or local transportation systems often sell prepaid cards on their websites. United Airlines hosts a travel crowdfunding platform. This allows people to get help from friends and family with funding a trip. Check it out here. After a hectic week of classes, sometimes it can be nice for students to just sit back, relax, and catch up on the shows you they might have missed during the week. 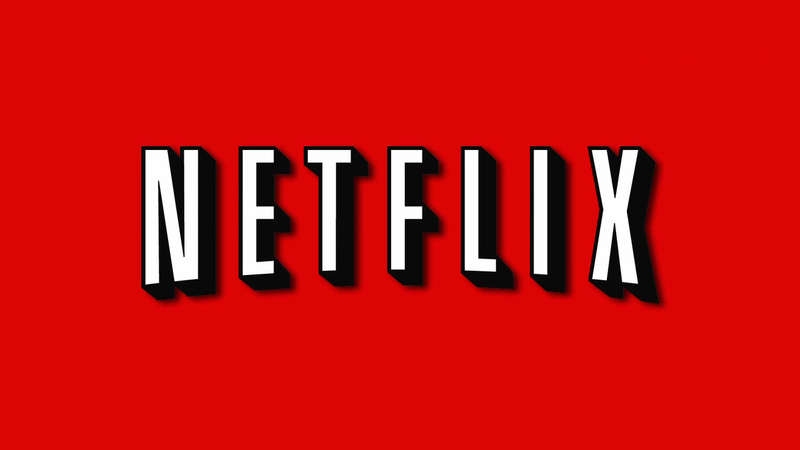 Subscriptions to streaming services such as Netflix and Hulu, and GameFly can help students decompress. Send your grads to school in style! College book stores have a wide selection of school-spirited clothing, including T-shirts, sweatshirts, jerseys, scarfs, sweatpants, shorts, hats, socks, and gloves. College-branded key chains, lanyards, coffee mugs, banners, and stuffed animals can also make great gifts and let students show off their school pride. You can also usually find college paraphernalia at major sporting goods stores, and on Amazon or other online stores. Checkout Fanatics where they have over 500 different collegiate licenses and sell a ton of nice clothing. Keep the freshman 15 off with healthier snack options. Eating healthy is tough in college. The dining halls don't always serve the most healthy options, there's a lot of processed snacks around campus, and students don't always have the money or means to venture outside of campus. That's why we suggest a healthy and wholesome food service like Graze or UrthBox. Graze is a portion controlled and nutritionist approved monthly service. UrthBox is similar but provides healthy, gluten free and organic snacks. These services are great because they will ship right to the student at college and will continue each month as long as you keep them subscribed. So it's one less thing they need to worry about while getting used to the college lifestyle. Another idea you can’t go wrong with. Sure, students will be reading plenty of course material while in college, but taking some time to read for fun is good for their mental wellbeing and gives their mind a chance to rest. Plus, it’s always nice to have new books to look forward to during the holidays. A Short Guide to a Happy Life: This short and simple book by Pulitzer Prize Winner, Anna Quindlen, is meant to show readers how good we have it. It is a book that will stay on the coffee table for generations. P.S. I Love You - A book of inspirational quotes filled with wisdom and life advice. This is a great read and keepsake for young adults heading into the real world. Lifes Little Instruction Book -This book is a great morale booster. When school or life is getting tough Lifes Little Instruction Book provides great advice to move forward with living a happy and rewarding life. to eat. 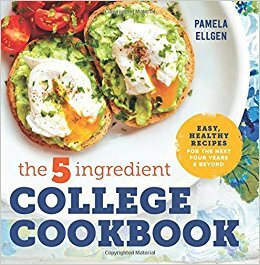 This cook book can help a student make delicisious healthy meals with only 5 ingredients. Why Didn't They Teach me This in School? - Let's be honest high school doesn't teach us all there is to know about the real world. This book lays out 99 personal money management principles to live by. For those students needing an update on any of these devices, graduation might be the perfect occasion. These devices will help students stay connected and organized during the year. A lot of stores like BestBuy or Walmart have discounted items for college students. Covers or cases for these devices could also make good gifts. Some classes prohibit using electronic devices. So sometimes students need to go back into time and use some old fashioned stationery. Stationery gift ideas include pens, notebooks, post-it notes, and calendars. Journals also make great gifts, as it gives students a space to express themselves and reflect upon their journey. At the end of the year, they can look back on their reflections and feel proud of all that they accomplished. 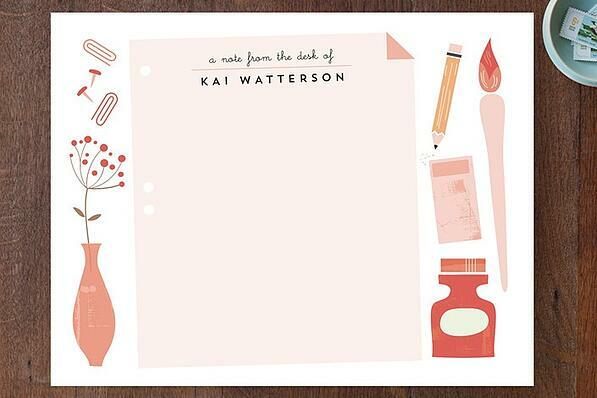 Personalized stationary is a hot trend right now. At Minted they give you the ability to createinteresting designs for thank you cards and letters. A big trend right now is monogramming. It's a cute and subtle way to stamp your name on things. Then your student will have a nice way to write thank you letters to their teachers and counselors. College students do a lot of traveling. Whether it's coming home for breaks, going on trips with clubs or doing semesters abroad, there's a lot of travel. 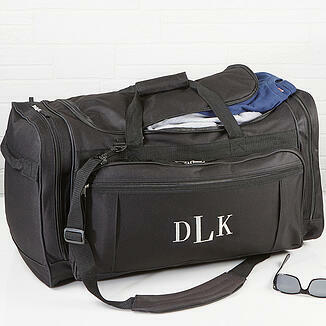 A nice gift idea is to get the student new travel bags with their name or monogram embroidered on it. You can get it done through the site Personalization Mall. Another popular trend right now is custom passport holders. It's a nice way of keeping their travel memories organized and stylish! Etsy does a lot of personalized passport holders. Check it out here. What are your favorite graduation gift ideas? Tell us in the comments below! From all of us at TestRocker, congrats to the grads! If you are a student who still needs to take the SAT or ACT, or a parents with teens who will soon need to take these tests, then it's time to start preparing. These tests are a huge factor in college acceptances. TestRockers average increased scores are +180 (SAT) and +4 (ACT). We've found that the students who score the best after using TestRocker have watched the most amount of our videos. 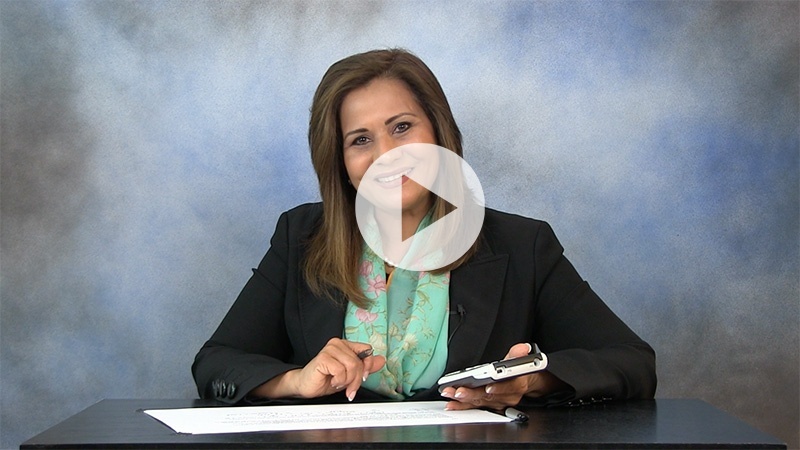 With 2000+ videos there's plenty of content to improve you or your students SAT & ACT scores. Give the free trial a try to watch some videos & try some practice quetions. For information on which test is easier click here. If you are thinking about studying over the summer you can learn about that here. We’ve all heard a million times that breakfast is the most important meal of the day. But who has time to make and enjoy a healthy breakfast when there’s so much else to do? 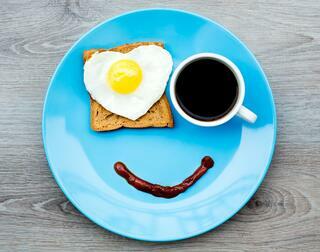 Unfortunately, with our busy schedules, many of us find ourselves skipping breakfast. If you’re taking the SAT or ACT any time soon, skipping breakfast is a habit you’re going to want to break. If you’re not a regular breakfast eater, ideally you should introduce it back into your routine a week or two before the test so that you don’t have an upset stomach the day of. Taking your test soon? Get 20 last minute strategies to instantly increase your score. So what should you have for breakfast the morning of the test? You should definitely have something you enjoy. This will help you de-stress and put you in a good mood. That said, you want to make sure you’re giving your body and the brain the proper nutrients to keep you on your A-game. Protein, protein, protein! This can include eggs, dairy products, or nuts. Whole grains. Instead of having white bread, try going for whole wheat bread. Oatmeal or granola with fruits or yogurt is also a great option. Other ideas for a healthy breakfast include eggs Florentine, breakfast burritos in a whole-wheat tortilla, an omelet with vegetables, and steel-cut oatmeal with bananas and peanut butter. In the mood for something lighter? Maybe have a protein or granola bar or a smoothie with milk, fruit, and protein powder. Also make sure you have at least a glass of water before the test and bring water with you to the test center. As tasty as they might be, you want to avoid sugary foods and coffee. While they may give you an initial energy boost, you might experience a sudden energy crash during the test. It’s also not a good idea to eat anything you’re not used to. It’s not a great idea to test your stomach right before going into a 4 to 5 hour test. As for after the test? Go ahead and spoil yourself! You’ve worked hard and you deserve it. Hopefully you can keep up this healthy breakfast routine even after the test. Can I Eat During The Test? The day of the test, you’ll likely be at the test center for anywhere between 4 and 5 hours. You’re not allowed to have food with you during the test and you’re only given a couple of 5-minute breaks to step into the hall and munch on something. If you have a healthy breakfast before heading to the test center, not only will you be able to sustain yourself during the test, but you’ll also perform better. Plus, there’s nothing more distracting than a grumbly tummy. What Kinds of Snacks Should I Take To My SAT or ACT Test? Snacks are a good way to re-charge during breaks. Take small bite items like granola bars, apples, pretzels, nuts and dry fruit etc. Stay away from anything too messy (dirty hands), spicy (upset stomach) or too sweet (sugar high). Not sure if you should take the SAT or the ACT? 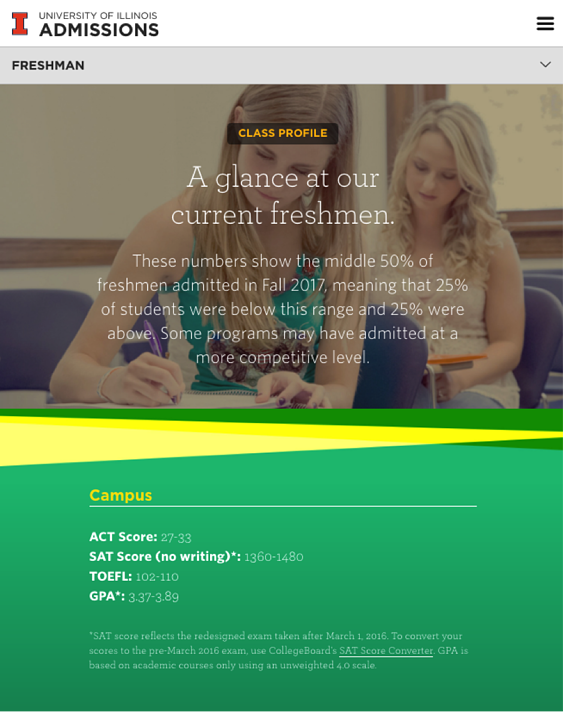 The ACT is a college admissions standardized test, similar to the SAT. It helps college admissions committees assess your academic ability and potential and your college readiness. Why should I take the ACT? 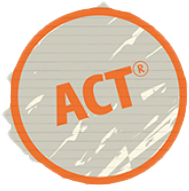 Most colleges require either the ACT or SAT as part of your application. Students attending public high schools in Alabama, Colorado, Hawaii, Kentucky, Louisiana, Minnesota, Mississippi, Missouri, Montana, Nevada, North Carolina, South Carolina, Tennessee, Utah, Wisconsin, and Wyoming require Juniors to take the ACT for their statewide assessments. Finally, you might be eligible for certain scholarships based on your ACT score. Learn more here. From the point of view of colleges, it doesn’t matter. All US colleges will accept either the ACT or the SAT. Ultimately it comes down to your personal preference. Visual thinkers who like charts, tables, and graphs might prefer the SAT. Those who love to read and work well under time pressure might prefer the ACT. You can also take both to keep your options open when it comes to sending your scores to colleges. Want to find out which is the best test for you? Click here to find out with just a few questions. What is the ACT scored out of? ACT scores range between 1 and 36. For each of the four required sections, you get a raw score, which is the number of questions you get right. Your final score, known as the composite score, is the average of your four raw scores. TABLE: What is on the ACT? How long is the test? The test covers English, math, reading, science, and an optional writing section. The total duration of the test is close to 3 hours, plus 40 minutes for the optional writing section. Pre-algebra, elementary algebra, intermediate algebra, coordinate geometry, plane geometry, trigonometry. Text reading, analysis, and writing skills. Students produce a written analysis of a provided text. It is recommended that you first take the test during the 2nd semester of your junior year (11th grade). This way you will have learned all the material covered in school, but will have plenty of time to retake the test. You want to be done with all your testing by October or November of your senior year. Do I need to prepare for the ACT? When should I start preparing for the ACT? You should absolutely prepare for the ACT. Preparing will help you improve your score, which will increase your chances of getting into more schools. It is a good idea to start preparing after your sophomore year (10th grade). The summer between your Sophomore and Junior years is a great time to start preparing because it gives you ample time. ACT prep is not something you want to leave to the last minute. Start a Free Trial for TestRocker's one of a kind ACT test prep! You can take the ACT up to 12 times. The test is offered 6 times during the year. At TestRocker, we recommend that you take it a maximum of 2-3 times. We have not seen much of a score improvement beyond the 2nd or 3rd attempt, so it’s best to spend your time on other parts of your college application. You register online on the ACT’s website. Make sure you check the registration deadline in advance. Also be sure to check the testing center nearest to you, as it may not be administered at your school. Can I use a calculator for the math sections? Yes, you are allowed to bring a calculator, but it must be the right kind of calculator. Bringing a TI-89 is the most common reason students are dismissed from the ACT. Check out this free lesson on ACT calculator tips. TABLE: How much does it cost to take the ACT? Standby testing $51 Placed on waitlist for particular test center/date. Refunded if you are denied admission on test day. Test center change $25 Keep your location, change the test date. If it’s after the registration deadline, you’ll also be charged the late registration fee. International testing $51 Testing outside of US, Canada, or US territories. 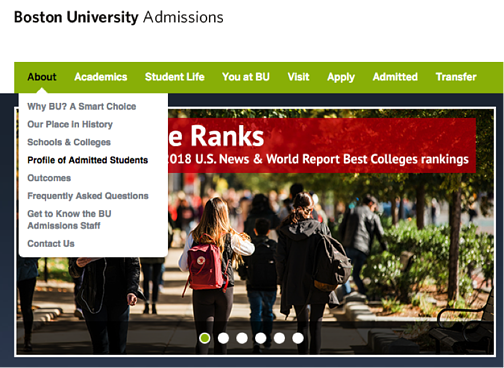 Score reports for additional colleges $12 each Request online before test date. Are there accommodations for students with disabilities during the ACT? Yes. You can request accommodations online on the ACT website by filling out proper documentation. Getting ready to take the ACT? Start TestRocker's Free Trial for sample questions and videos. 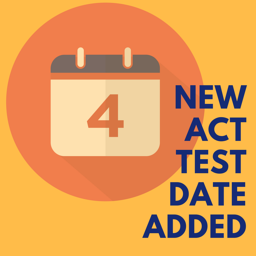 New July ACT Test Date Added for 2018! When will the July ACT first be available to take? The July ACT will first be made available in 2018 on July 14th. While the College Board has introduced a new August SAT test date beginning in 2017, the ACT test dates remain unchanged for 2017: April 8th, June 10th, September 9th, October 28th, December 9th. Where will the July ACT be available? The test will be available to all students in the United States, except for New York. International test centers will not be offering the July ACT. Why should I consider taking the July ACT? Summer = Precious Free Time: The test is in mid-July which means you have part of your summer break to focus and prepare, without having to worry about regular school work and after-school activities. Taking the test in the summer gives you time to focus on other things during your senior year, such as keeping your grades up and working on your college application. Read more about whether you should study during the summer. Early College Applicants: For those of you who plan to apply to colleges Early Action or Early Decision, this test date gives you an extra opportunity to raise your score and still have one final attempt to bring it up further if needed in the Fall. Makes time for the SAT or Subject Tests: If any of the universities you're applying to require you to submit SAT Subject Test scores, getting the ACT testing complete and out of the way sooner leaves you more time to prepare for subject tests in the Fall. Additionally, the same logic applies if you're also taking the SAT. Not sure if you should also take the SAT? Find out here. Counselors, Students, Parents: What do you think about these test date changes? We want to hear from you. Leave your comments in the box below! The SAT is a widely accepted standardized college admission test that helps Colleges assess your academic ability and potential in comparison with the rest of the applicants in your graduating class across the world. Since the test is standardized, it helps level the playing field so that students from all backgrounds have an equal chance to succeed. It’s a requirement: Most universities require a standardized test score (either SAT or ACT) as part of the college application. Scholarships: Many universities use your SAT score to see if they can provide you with merit-based scholarships. Still not convinced? Read our blog on Why the SAT is important! What is the SAT scored out of? The SAT is out of a total of 1600 points. Evidence based reading + writing are two separate tests each count for 400 points, for a total of 800. The math section is scored out of 800 points. TABLE: What is on the SAT? How long is the SAT? The SAT tests you for your math, evidence-based reading & writing skills. The entire test takes 3 hours (plus 50-minute optional essay). 80 Minutes Algebra, Problem Solving & Data Analysis, Quadratic & Higher order equations, Arithmetic operations, Geometry, Basic Trigonometry. Includes one 25 minute no-calculator section. Questions are mostly in multiple choice and a few free response formats. 65 Minutes Evidence based reading & writing, focusing on analysis of History/Social Studies, Science, Data & Informational graphics and vocabulary in context. 50 Minutes Tests reading, analysis and writing skills; students produce a written analysis of a provided text. Most students take the test 2nd semester of their junior (11th grade) year. Definitely plan to be finished with your SAT by October/November of Senior year. Do I need to prepare for the SAT? When should I start preparing for the SAT? Yes, you should definitely prepare for the SAT. Everyone has the ability to improve, and you want your SAT® score to match your potential so that you can get in to the best possible schools. Start preparing for the SAT® any time after your Sophomore (10th grade) year. Summer is a great time to start because you actually have time to prepare. You should prepare ahead of time – don’t leave it till the last minute. Although you can take the SAT as many times as you want, we recommend that you take it at least 2 times, and no more than 3 or 4 times. What is the PSAT? Why & When should I take the PSAT? How is the PSAT different from the SAT? Think of the PSAT as a baby brother of the SAT. It serves as a practice test to show you what the SAT® is like. For most students, the PSAT serves as a good wake up call to start thinking about college application process. The PSAT is administered in October. While you can take the PSAT as a Sophomore, you should definitely take it as a Junior as your PSAT score could qualify you to enter National Merit Scholarship programs. Learn more about why studying for the PSAT can be benefitial. How do I sign up for the SAT? You can register online at SAT.collegeboard.org. Make sure you check the registration deadline well in advance! Also make sure to check the nearest SAT testing center to you – it might not be administered in your school. Yes and no! The SAT has one no-calculator section where calculator use is not allowed. For the other section, however, you may use your calculator. Make sure that you check what types of calculators are allowed! For more Calculator tips, click here. TABLE: How much does it cost to take the SAT? Are there any special allowances for students with disabilities? Yes, the SAT can accommodate students with disabilities, once correct documentation has been provided and validated by the College Board. Contact the College Board for more information. 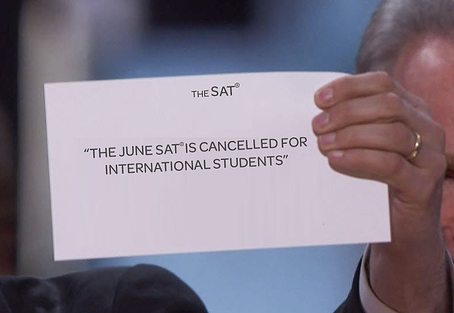 Many international students who have been preparing for the June 2017 SAT were recently shockedto hear that The College Board has cancelled the 2017 June SAT for international students. Until these recent changes, the SAT was offered internationally 6 times a year; January, May, June, October, November & December. Going forward, the SAT will only be offered internationally 4 times a year. No credit card or commitment required! The College Board had previously announced that it would be reducing the number of international test dates in the near future as an effort to reduce the number of cheating incidents that have been occuring at international test centers. The June SAT cancellation was the first test date to be cut. From 2018 onwards, the SAT will be offered 4 times a year for international students. Students can expect to see test dates in March, May, October & December. In speaking with various international schools around the world, it appears that of these four test dates, October will be the most popular. If you plan to take the October SAT internationally, make sure you register early before test centers fill up. What should I do if I was planning on taking the June SAT? Option 1: Take the May SAT instead, as long as you register by April 7th. This date might not work for you if you have final exams around that time. It also reduces the amount of time you have to prepare by one month. However, it leaves October & December as back up options in case you don’t do as well as you hoped. Option 2: Take the October SAT instead. This date will give you more time to prepare. However remember that October will be very busy with college applications and keeping up with your school grades and extracurricular activities. You will also be left with only December as a back up test date incase you don’t do as well. This won’t work if you’re applying early decision to schools, however many universities will accept your December scores. Make sure you check with the universities you’re interested in before picking December as a test date. Consider the ACT: The ACT is equally accepted by all US universities. The test is offered internationally 5 times a year (September, October, December, April & June). If these test dates work well for you, it might be worth registering for the ACT as well. Want to know if you're well suited for the ACT? Click here to find out by taking a 2-minute free self-assessment! 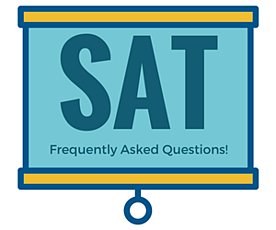 Take SAT Subject Tests in June: If you were already planning on taking a test in June, and the universities you’re applying to require SAT subject tests, use the June test date to take a subject test instead, since the June SAT Subject tests haven’t been cancelled! Remember that you can take up to 3 SAT Subject Tests on the same day, but you can’t take the SAT and Subject Tests on the same day. So the June test date is an ideal one to take the subject tests! Planning on taking the SAT or ACT? Our TestRocker experts can help you get prepared. There are endless studies and research proving that studying a foreign language in school is extremely beneficial for reasons beyond just having a strong High School transcript. In fact, the College Board reported that students who complete 4 years of studying a foreign language performed better on the SAT (100 points or higher) than those who did not*! If you are currently in a High School Spanish course, here are some great tips from our friends at Language Bird . 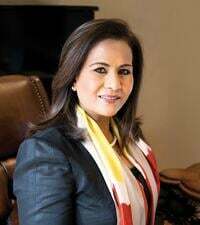 There is a helpful concept, coined by the renowned success coach Tony Robbins, called N.E.T. time. This stands for “No extra time, time.” N.E.T. time is the time taken doing mundane tasks that require little or no mental focus. Examples are exercise, commuting to/from school, going to the bathroom, walking the dog, walking from class to class at school, taking a lunch break, shopping, cooking, etc. These activities add up to HUNDREDS of hours of your life every year. Take advantage of the N.E.T. time in your life and study your class notes simultaneously. Study your notes out loud. Science shows by actually saying (Spanish) sentences and words out loud, additional pathways are physically created in your brain that will help you to remember the information! Americans are notorious for egregious Spanish accents. This does not have to be you though! You must apply some strategies that will help you to clean it up quickly. Teléfono - Many students will ignore the accent mark and speak with the accent over the “o.” This has nothing to do with difficulty in saying it correctly. It’s just lazy. Don’t let this be you! Speak as the accents are written and your speech will be more beautiful. Gracias – Many students will default to the American “r” sound and harsh “a” sound as in “Apple.” Don’t do this! Listen to your instructor and copy them. The “a” sound is more like “ah” and you don’t need to learn to roll your “r” for this words – it’s just one touch of the tongue. Your friends are already the good students? Fantastic! Sit by them. During group conversation exercises their skills will help to push you. If your friends are not necessarily the top students in the class, of course you will enjoy sitting with them, but we also know that it’s simply a massive distraction. Instead, choose to sit with some other people or at least solo! This is simple. Just do the work. Homework often counts for a large percentage of your grade and doing the work, even if it’s not all correct, can nearly guarantee you’ll pass the class. Make it your mission to raise your hand at least once every class. The instructor will love you! Afraid other students will judge you? Who cares! Let them. Don’t be afraid of asking your teacher questions during and/or after class. Many teachers love it when students are engaged and interested in learning their subject matter and feel honored and excited that you asked. Don’t be shy! Now is a great time to learn how to advocate for yourself! In college, it will be all up to you, so practice now! This means you need to find help for yourself when you need it before the situation is beyond repair! If you feel like you are falling behind and you don’t know what else you can do, talk to your school counselor or another adult you trust on campus. They can provide suggestions or resources available to you that you may not know about. Additionally, you can always call LanguageBird if you need! They are happy to provide you with Spanish courses online with their instructors. You will receive high school credit accepted by colleges all over the U.S. and approved by the University of California and NCAA.